Welcome back my little darlings, I promise I won’t be killing you. 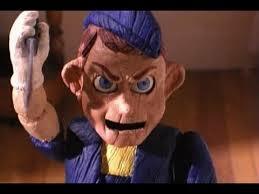 I am here to entertain you today with the top ten horror movies featuring puppets. So, have a seat, relax and let me play your heartstrings with a list sure to have you applauding. 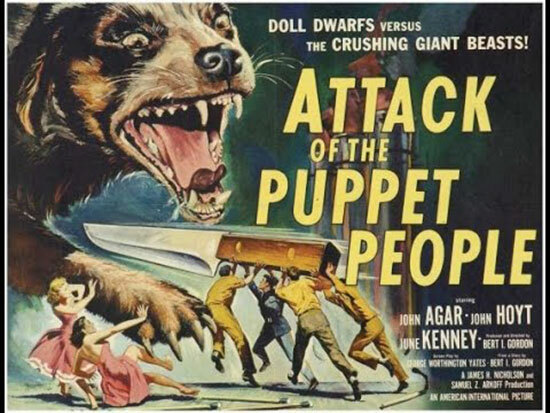 Sitting at the tenth spot on our list is the 1958 classic “Attack of the Puppet People.” This film was written and directed by Bert I. Gordon and its plot is centered around a Brownie troop visiting Dolls Inc. as well as character Sally Reynolds (June Kenney) and Bob Westley (John Agar). Reynolds answers an ad for a secretary position posted by the mysterious owner of the company Mr. Franz (John Hoyt) and Westley a traveling salesman after a few weeks tries to get Reynolds to elope with him. When Westley goes to break the news to Mr. Franz things don’t go as planned and the next day Reynolds sees a doll just like him. As the story progresses we find that Mr. Franz has developed a way to shrink people into toy-like figures and place them in a state of suspended animation making them his personal puppets. The film itself was rushed through production and in certain places it seems like they could have done a bit more with it, but for 1958 the film still holds up well. Stealing the ninth spot on our list is the 1978 “Magic,” directed by Richard Attenborough. This psychological horror flick features Anthony Hopkins, Ann-Margaret, and Burgess Meredith and has a great musical score composed by Jerry Goldsmith that really helps build the tension. 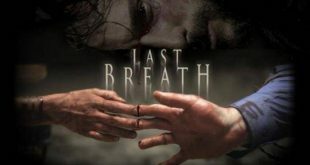 The plot is centered around Charles “Corky” Withers (Anthony Hopkins), who after failing at his first attempts to become a professional magician consults his mentor about what he should do. 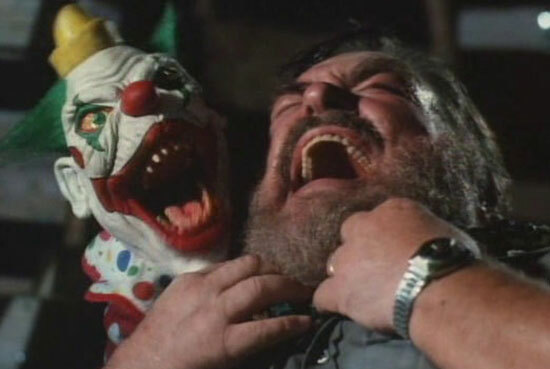 After being told to come up with a better gimmick, Withers returns years later performing as a magician/ventriloquist with his trusty puppet “Fats.” As the film progresses we find that Withers is afraid of success and attempts to back out of a television deal because his puppet has taken over a portion of his psyche as part of a split personality. The body count starts to rise as “Fats” convinces Withers that everyone else is a threat to their relationship making for a great psychological thrill ride. 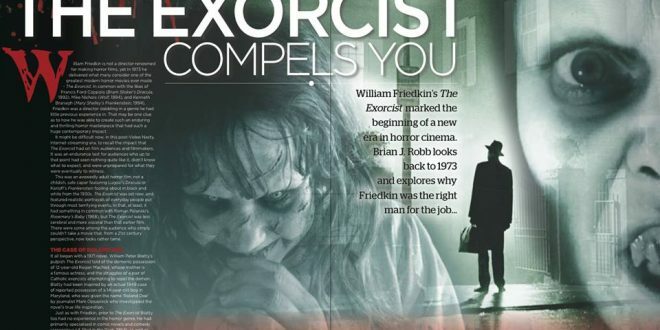 The eighth spot on this list is occupied by the 2004 hit film “Saw” directed by James Wan. 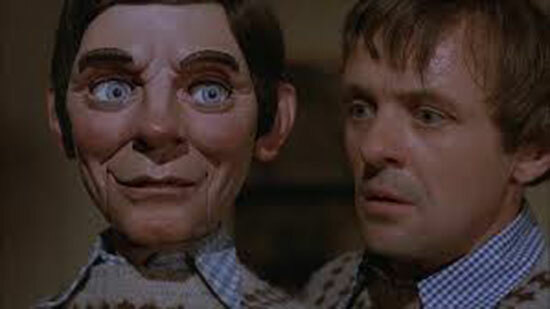 While the plot of this film is centered around a doctor and the man whose been tailing him trapped in a sinister genius’ cat and mouse game and a serial murder investigation, rather than specifically being centered around puppets, it still features an iconic figure. 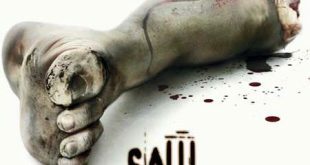 Jigsaw employs the use of a very startling puppet that has solidified its position as one of the most iconic and creepy puppets in the horror genre. 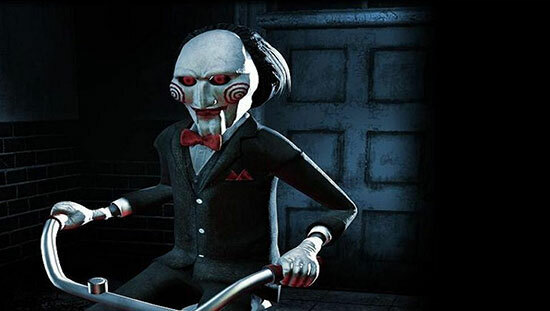 So recognizable is Jigsaw’s puppet among fans of the horror genre and those yet to be initiated to our dark realm that the film had to be included. 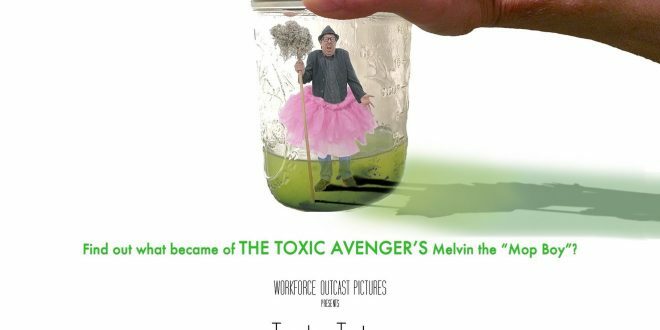 The lucky number seven spot is occupied by the 2008 film “Triloquist,” directed by Mark Jones and produced by Jack Edward Sawyers, Marlon Perry, and Michael Levine. This film tracks the downward spiral of a ventriloquist/drug addict, who overdoses leaving her oddly supernatural dummy (Bruce Weitz) behind as the only legacy her children Angelina and Norbert, have. After the death of their mother our main characters are left with their abusive uncle who is later murdered by the dummy. Following this the dummy is locked away for several years until Angelina (Paydin LoPachin) and Norbert (Rocky Marquette) have reached adulthood. From here the three are reunited and embark on a bloody journey to keep their family legacy alive. 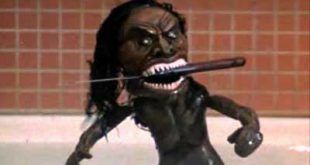 The sixth spot on our list is occupied by the 1999 Full Moon Entertainment film “Demonic Toys.” While this film went from film to video it still possesses some unsettling scenes. The plot centers around two romantically linked cops Judith Gray (Tracy Scoggins) and Matt Cable (Jeff Weston) as they attempt to catch some drug dealers meeting at the Toyland Warehouse. After a bloody shootout, the drug dealers and the police at the scene soon realize that things are not what they seem as toys, dolls, and puppets come to life and start to add to the body count. 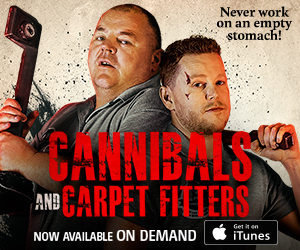 This film is sure to catch you with some cheap jump scares and at the very least give you some laughing fuel. 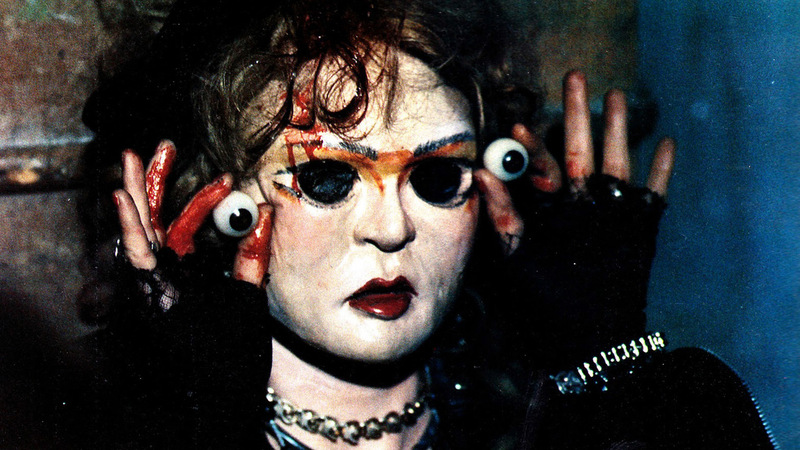 We’ve reached the half-way mark on our list and at the fifth spot is occupied by the 1987 Stuart Gordon directed “Dolls.” This film was largely considered to be a commercial failure as it grossed only $3.5 million worldwide on a budget of $2 million, but I believe it still holds some value as a decent puppet horror film. 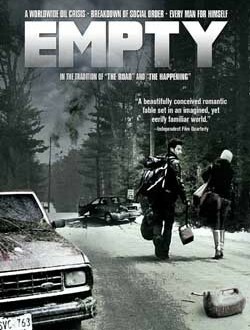 It features Stephen Lee, Guy Rolfe, Hilary Mason, Ian Patrick Williams, and Bunty Bailey for its cast and its plot is centered around a group of people stranded in an old mansion during a violent storm. We quickly learn that mansion is the home of an old puppet maker and his wife, who have been imprisoning the souls of immoral people, being punished for the sins they committed in life. The fourth spot on this list has been sewn up by the campy 1996 fantasy horror film “Pinocchio’s Revenge,” directed by Kevin S. Tenney. The film features Rosalind Allen and Todd Allen and is a direct-to video tailored film. The plot is centered around a lawyer who brings home a wooden puppet that was found buried with a boy that was supposedly killed by his father. Their daughter 8-year-old daughter Zoe sees the doll and takes it as her own. Soon accidents begin to happen, and the puppet begins to get violent forcing the family to eventually culminate in Zoe having a psychotic break. The third spot on our list is occupied by the 1985 German film horror-fantasy film Joey directed by Roland Emmerich. This film centers around a boy who loses his father and is later terrorized by a demonic dummy attempting to possess him. The dummy Fletcher, uses its supernatural connection to the realm of the spirits in attempts to isolate Joey (Joshua Morell) from everyone around him so that he can break into our world. 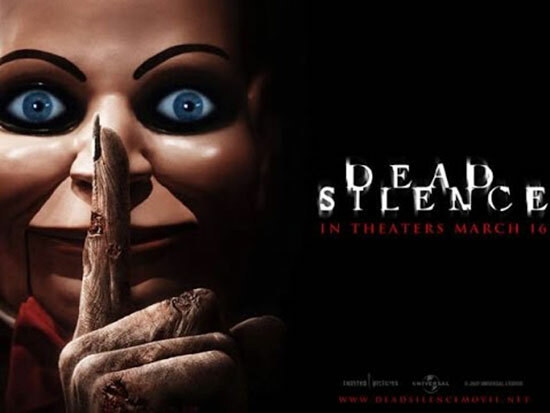 The second spot on this list is occupied by the 2007 horror-thriller “Dead Silence,” directed by James Wan. 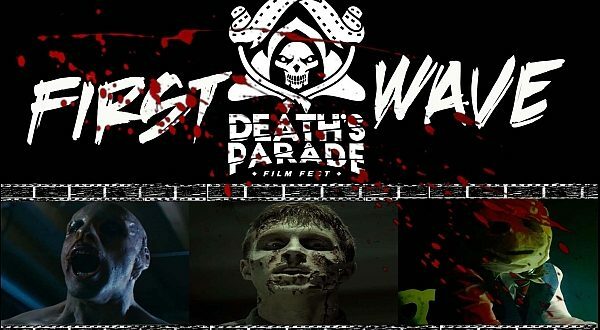 This film follows Jamie Ashen, who after the brutal death of his wife Lisa, following the delivery of a mysterious puppet named “Billy,” must return to his hometown of Raven’s Fair to confront some family history. The plot thickens upon his return home as things become quite clear that the town is under the control of a sinister force. This film is full of jump scares and real tension that reminds us that sometimes you might not be able to scream. The number one spot on this list occupied by a classic film that spawned an entire series of films. 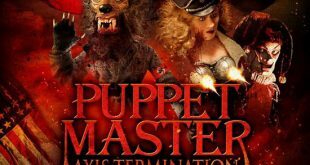 The 1989 “Puppet Master,” directed by David Schmoeller, is an iconic film that you can’t help but appreciate for its attempts to use a difficult concept to scare its audience. The plot focuses on a conflict between a team of psychics, whose colleague plots against them using an Egyptian spell to awaken demonic puppets to fight them. 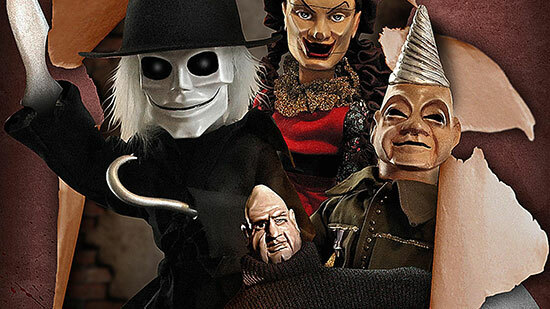 The film has developed a cult following and has spawned a whopping twelve sequels featuring some of the same iconic puppets, while adding plenty of new faces along the way. I hope you’ve all enjoyed our list of the top ten horror movies featuring puppets and let us know if we missed one of your favorites. As always, I thank you for your time and consideration my darlings and until next time remember to stay scared.